Just before dawn this morning, thick frost glimmered in the fading light of a full moon. 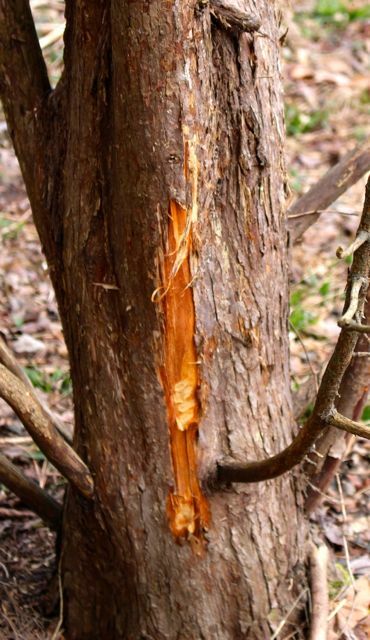 As the sun topped the nearby ridge, surfaces sparkled — walks, benches, lawn, even the trees. 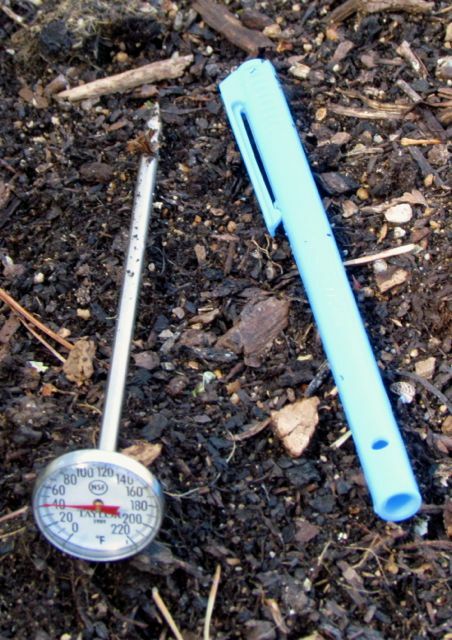 The thermometer on my cold hill bottomed out at 26 degrees Fahrenheit before the strengthening Spring sun began its work — Winter cold. Too cold. The Spring Peepers, which have lustily chorused off and on since late December, have been utterly silent for four days. The American Toads, which had added their exquisite soprano trilling descant to the thrumming of the Peepers two weeks ago, have also gone quiet. The Green Anoles, which sunned themselves on our gutters on warm days all winter, have not ventured from their sleeping chambers in a week. To be sure, our weather has not been fit for cold-blooded amphibians and reptiles. The plants in my yard agree. Half-open flower buds have opened no further. Some have browned from freeze damage. Others seem suspended in time, waiting for temperatures that match the astronomical calendar, knowing the equinox was last week, wondering like me, I imagine, why March turned so cruel in its waning days. But while the plants and cold-blooded animals sleep, the warm-blooded ones are scrounging for food. A herd of five pregnant does devours every blade of green from our floodplain at dusk, when they emerge from their hiding places on the other side of the creek. Dark shadows in darkening light, they drift around the trees, more ghosts than flesh in the dimness. The birds, on the other hand, have refused to concede to Spring’s reluctant arrival. Growing flocks of American Robins patrol the landscape, plucking fat earthworms from rain-moistened soil, muttering in delight at each new-found morsel. 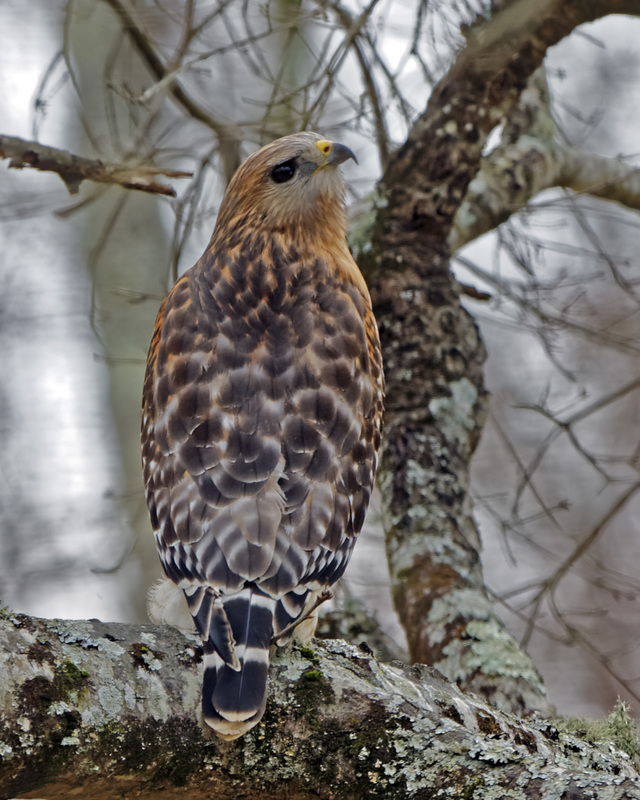 The Red-shouldered Hawks circle the floodplain, then dive at crowded bird feeders in the hopes of pinning a slow-moving Mourning Dove or a greedy Red-winged Blackbird that lingers too long for one more bite. When the birds elude their grasp, they settle for patrolling the ground, pulling back fallen leaves with sharp yellow talons to reveal earthworms, which they greedily devour. When they’ve had their fill, they fly off with more; hungry nestlings must be fed, even while their favorite cold-blooded prey sleep securely in their winter hide-outs. Nestlings must eat regardless of weather. Flocks of Purple Finches grow daily. I think groups migrating from further south have heard about the snows in their summer homes up north. They linger at my feeders — free food — all you can eat! A pair of Carolina Wrens busily inspect flower pots, deck underpinnings, and an open garage for potential nesting sites. Wood Ducks paddle up and down the creek, preferring water warmer than the air. A Great Blue Heron stalks from sand bar to sand bar. Rising into the air on massive wings, its majestic flight starkly contrasts with its harsh squawk of frustration at finding nothing tasty. 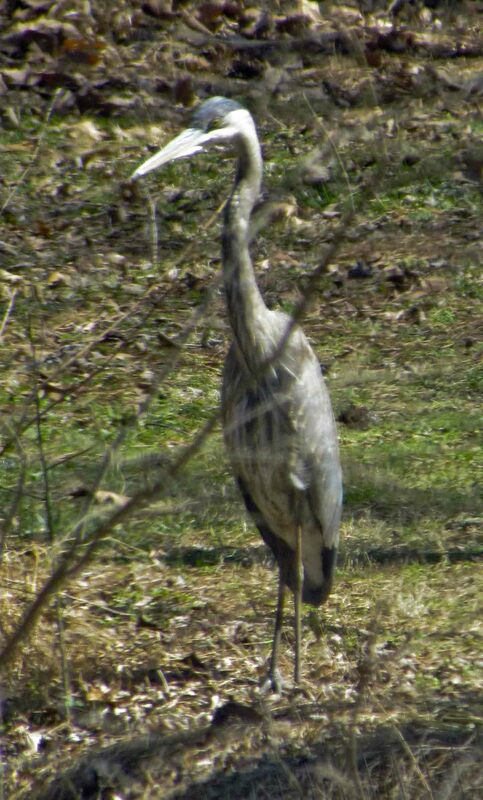 Alert for anything that moves, the hungry Great Blue Heron remains statue still. Suet feeders are perpetually busy from dawn to full darkness. 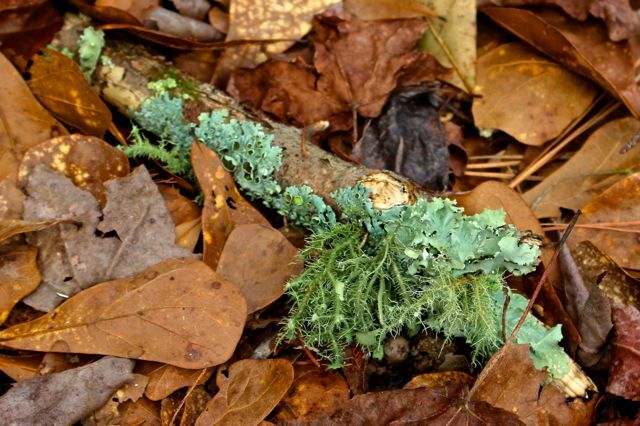 Woodpeckers and nuthatches are feeding nestlings, and insects are difficult to find in the frigid air. They are joined by increasing numbers of warblers, which must be arriving for spring nesting season. Like the woodpeckers, suet is their fall-back food until the insects finally emerge. This morning as I filled the feeders, I heard the characteristic melodic gurgling call of Brown-headed Cowbirds. They usually arrive a few days after the warblers, lingering at my feeders until they pair off, and egg-heavy females deposit their eggs in the nests of unwary warblers. 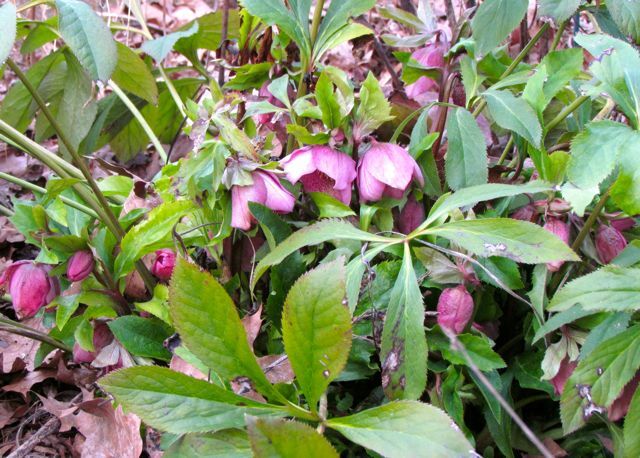 Warm-blooded life does not seem to have the luxury of waiting for Spring to assert itself. Somehow it must carry on despite the dearth of natural food and warming nights. I keep my feeders filled and birdhouses clean, in the hopes that this eases their struggle a bit — for my local population anyway. The weather forecasters predict that our perseverance will be rewarded. Warmer days are promised soon. I think perhaps they might be right. I spotted a bright yellow Eastern Tiger Swallowtail this afternoon struggling to make headway against a gusty northwest wind. Any minute now, Ruby-throated Hummingbirds will be arriving for their spring nesting season. 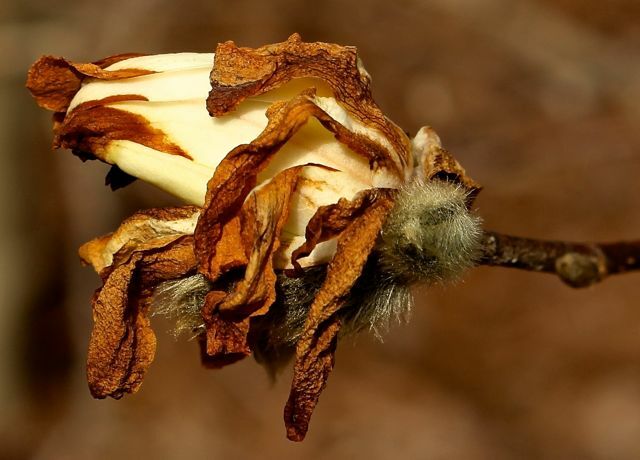 I’d best dust off their feeders ASAP, because their usual early food sources — blooms of Red Buckeye and Eastern Columbine — remain tightly closed against the unseasonable chill. Not even a flower bud is yet in evidence on the native Coral Honeysuckle beloved by the hummingbirds. Like the warm-blooded life surrounding me, my garden and I must persevere. Lettuce transplants huddle beneath garden fabric in the vegetable garden. I’ve been afraid to check on them, fearing that lifting the fabric might chill them more. 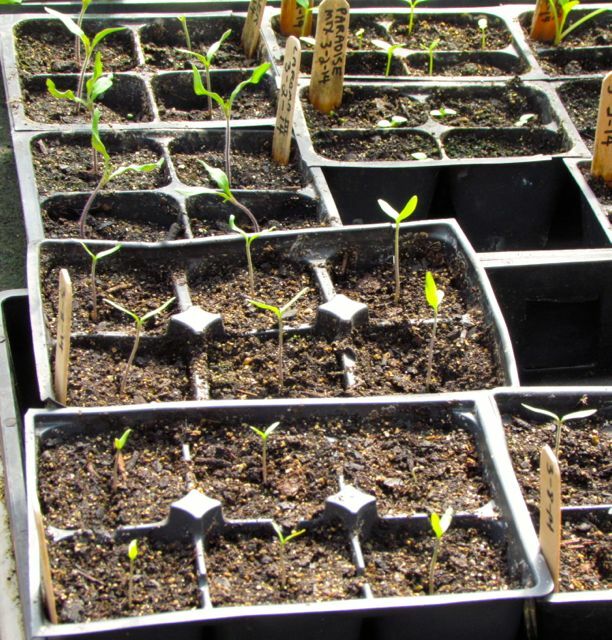 And the tomato and pepper seeds I sowed a week ago have mostly germinated in the greenhouse. 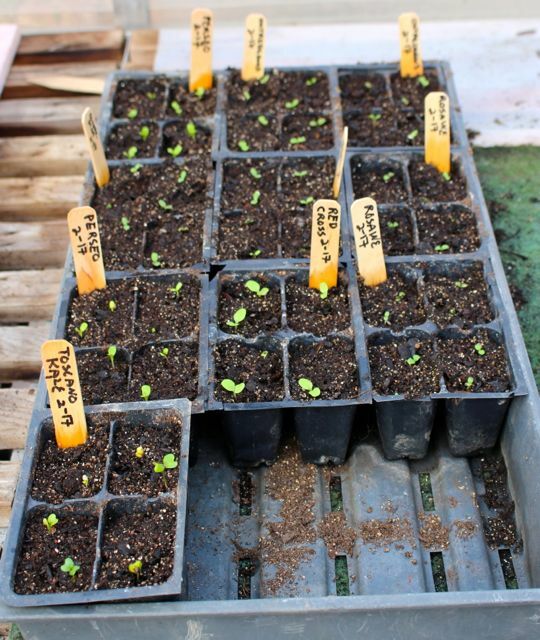 I’ve raised the thermostat to reduce the chances of cold air being fanned onto new-born seedlings. Gardening is always an act of faith. This season, however, is requiring a bit more of it than usual. Believe, my friends. Soon we’ll be up to our knees in tall grass, mosquitoes, and summer squash. But don’t blink. I have a feeling we’re mostly skipping Spring this year. Tomorrow, the weather seers are forecasting cold rain for my region, a rain that may end tomorrow night as a light dusting of snow. If it occurs, that will be the first, and I suspect, last frozen precipitation of the season. I’m much more interested in the rain forecast. Earlier in the week, the weather gurus were promising me 1.5 to 2.0 inches of rain. Today they have backed off to a measly half inch. We’re in moderate drought here, and as buds swell and early flowers bloom, the tiny bit of soil moisture we have will be rapidly consumed by thirsty just-wakening plants. This morning just after dawn when Wonder Spouse went out to fetch the morning paper, he called me outside so that I could hear voices we haven’t heard in our yard in fifteen years. The haunting pipe-organ-deep calls of two Great-Horned Owls echoed across the floodplain as they called back and forth to each other. My bird books tell me they probably nested a month ago. Perhaps they were searching for one last tasty rodent to feed nestlings before they all settled in for their daily snooze. We are delighted these nighttime hunters are back. Don’t get me wrong, we love the Barred Owls that have shared our landscape with us from our first year here. Their calls are lovely as they echo through naked trees, but to my ear, the calls of Barred Owls are much livelier — friendlier, if you will — than those of their Great-Horned cousins. Both sets of dawn-calling voices are welcome in my landscape as the sun begins to color the eastern horizon. The more rodent-eaters in my landscape, the better, I say. I’m a little worried about the impending salamander larvae. 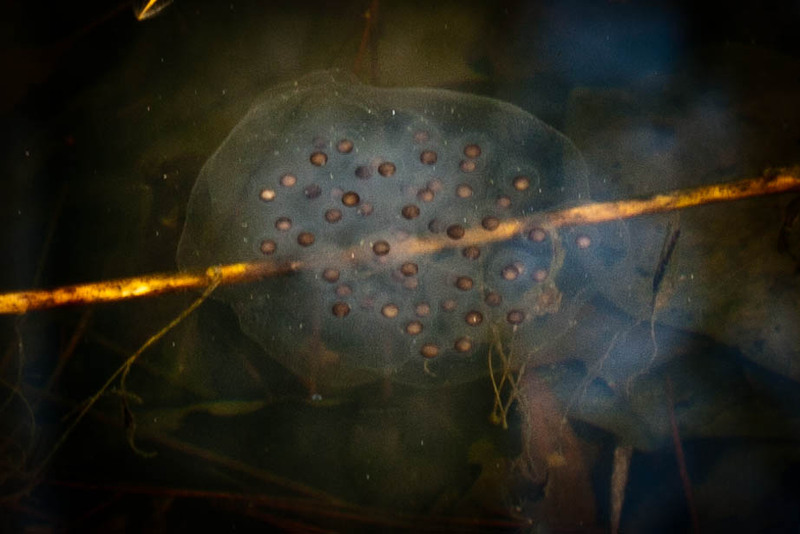 Today I noticed at least one enormous bullfrog tadpole loitering in the shallows of the pond. They are notorious gobblers of anything that moves. Wonder Spouse and I are considering investing in a net so that we can remove these unwelcome additions to our salamander haven. Also on that day, I loaded up the germination chamber with newly sowed seeds of three pepper varieties and one tomato variety — Super Marzano. Peppers are notoriously slow to germinate, usually taking at least a full week even with bottom heat in my cozy germination chamber. I had room for one tomato variety. I picked Super Marzano because the package says they require 90 days from planting to picking. That’s about 20 or so days longer than most of the other varieties I’m planning to grow, so I figured they could use a head start. Today, 8 of the 12 seeds I sowed have germinated. 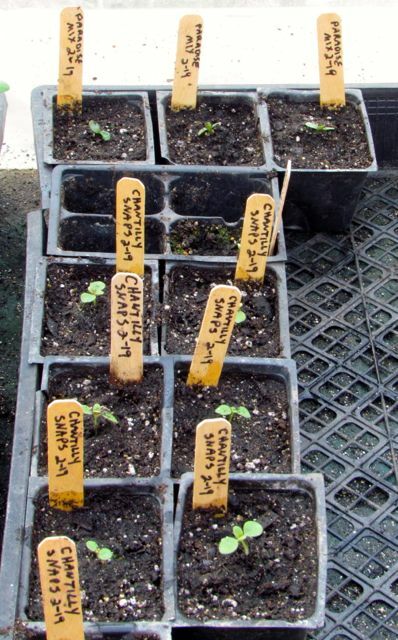 Some are taller than others, but you can see at least parts of 8 seedlings as they push their way toward the light. Also on Valentine’s Day, my onion plants arrived in the mail — one bunch of Yellow Granax Onions. They are kin to the sweet Vidalia onions of Georgia fame. They did very well for us last year, so we figured we’d try them again. Of course, they arrived after I’d finished gardening for the day, and their bed wasn’t ready yet anyway. Fortunately, these dormant little plants can wait up to a week to be planted, so I tucked them into a dark, cool spot in the garage and promised them I’d get to them soon. 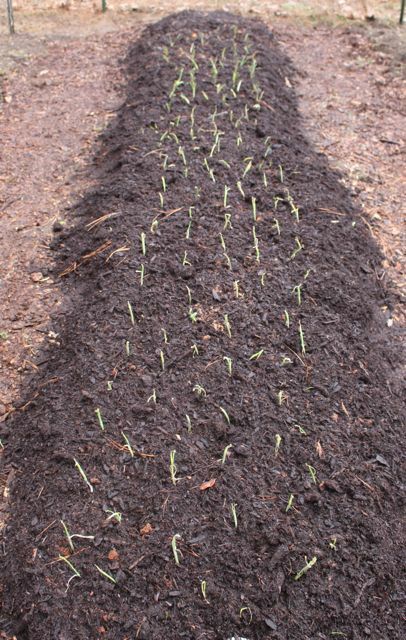 Last Thursday, I sowed Sugar Sprint Snap Peas into the bed I’d prepared for them the weekend before. This is two full weeks earlier than I’ve ever planted peas before, but I’ve also never seen a “winter” like this one before. 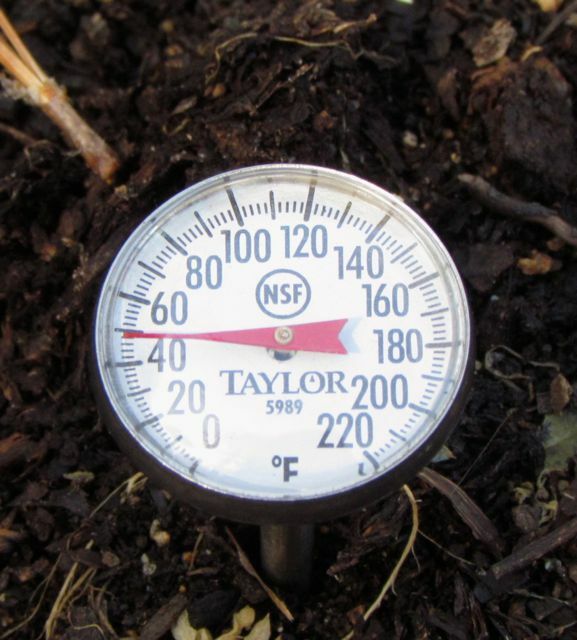 The soil was barely moist and merely cool, not cold. It took four gallons of water from the watering can to moisten the soil sufficiently after the peas were tucked in. 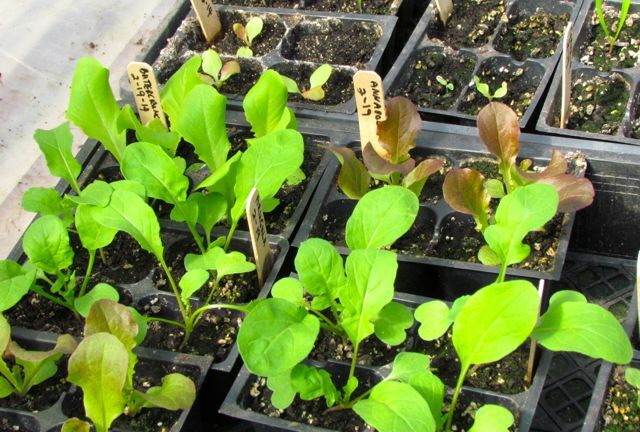 I am hopeful they’ll be eagerly sprouting next week when our absurdly mild February weather returns. They don’t look like much now, but in a week or two, they’ll be greening up and thickening. 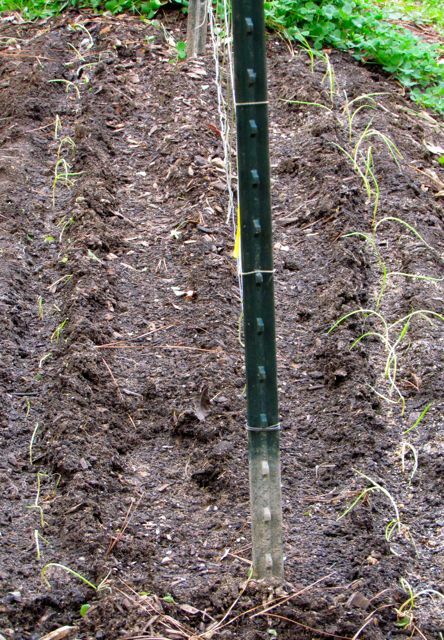 Right now the roots are rehydrating; tomorrow’s chilly rain shouldn’t hurt them at all. Even a little ice shouldn’t bother them at this stage. The challenge with onions is water; they need an inch a week. I’m definitely gambling on the weather with these veggies. 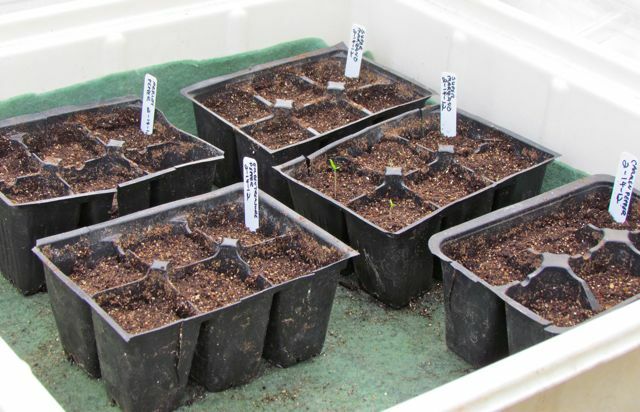 As soon as the peppers and Super Marzano tomatoes finish germinating, I’ll be moving them onto a greenhouse bench so that I can sow more tomato varieties. 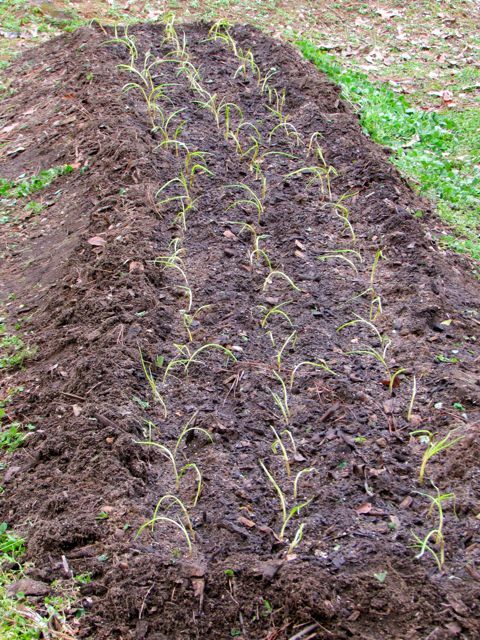 Meanwhile, I’ve got to prepare the other beds in the spring garden quadrant of my garden, so that I can sow carrots, beets, and many more lettuces and spinaches. 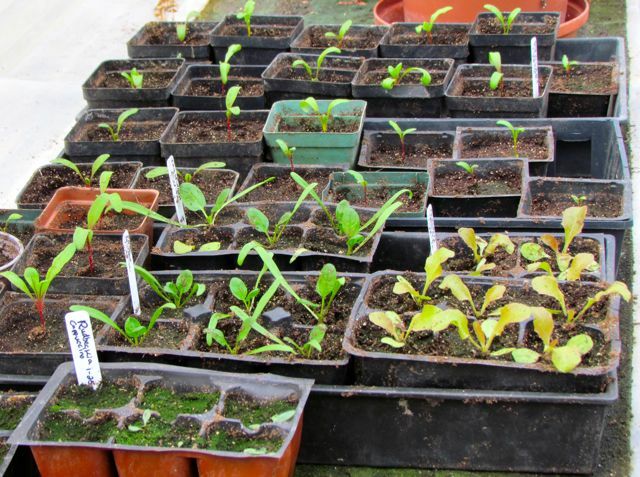 Plus I’ll be transplanting the starts growing in the greenhouse. I’m aiming for the end of the month to have the spring garden completely planted. 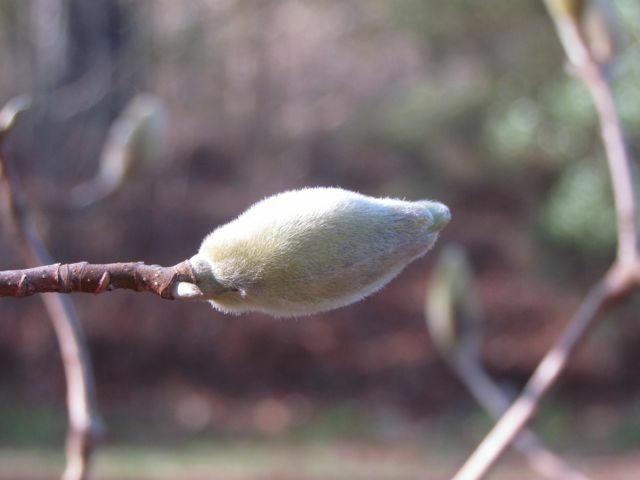 That will be two to three weeks earlier than I’ve ever done this in all my 40+ years of gardening in the Piedmont. 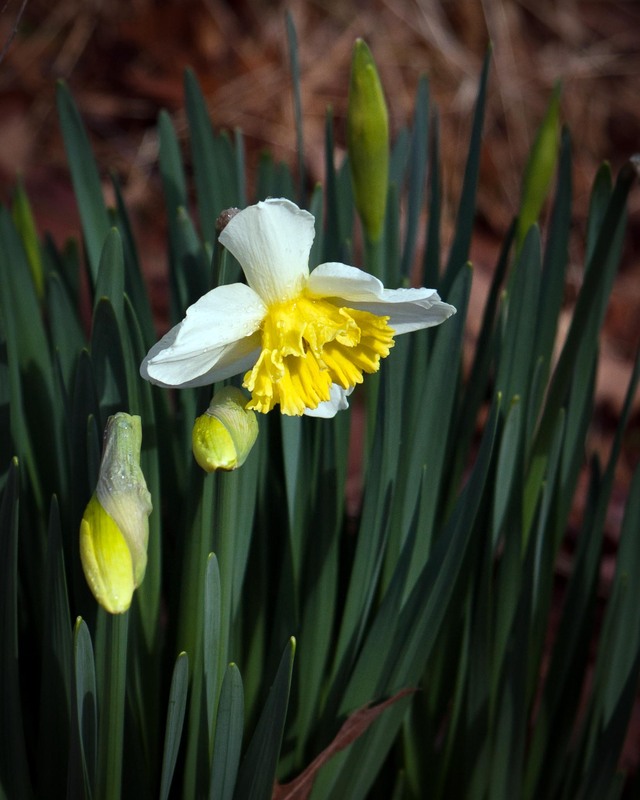 Will I regret my rush to take advantage of what seems to be a record early spring? Maybe, maybe not. But for good or ill, the game is on! 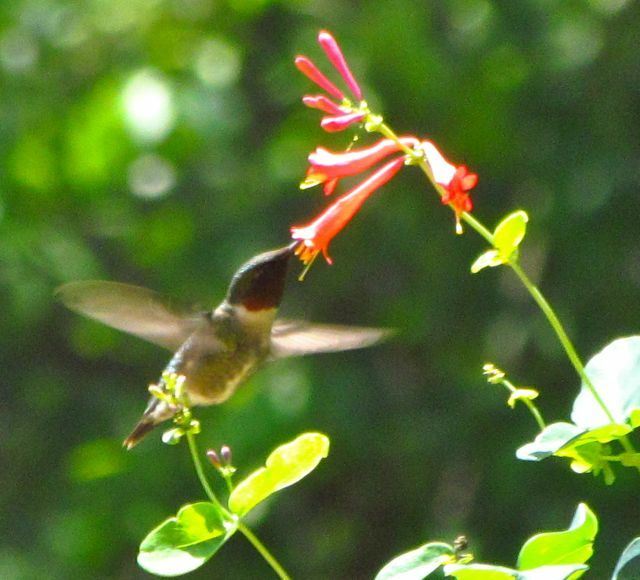 On this day that has come to serve as an acknowledgement of love, I thought I’d share a few pictures that illustrate how the amorous intentions of flora and fauna in my Piedmont, NC yard are faring this year. 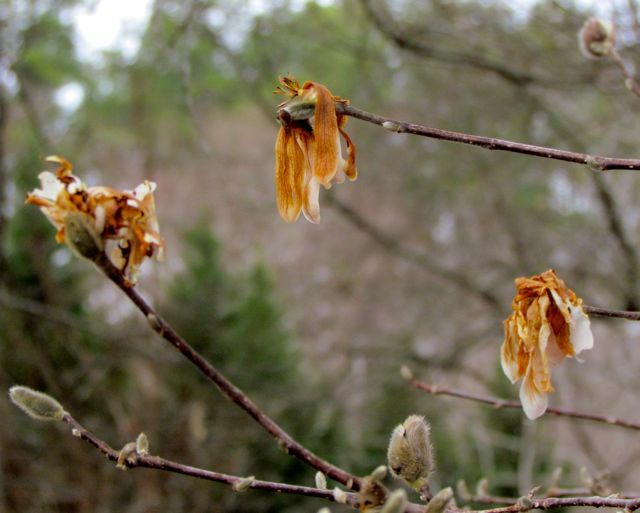 You may recall the precocious flowers of my Royal Star Magnolia that I documented here. As you can see from the photo at the top of this entry, the groundhogs got their revenge yesterday just before sunrise, when the temperature on my hill registered 15.7 degrees Fahrenheit. That’s plenty cold enough to zap delicate white petals floating twenty feet in the air. I count that as a love labor lost; those flowers won’t be getting pollinated. However, fat fuzz-covered buds still abound on this tree, so perhaps love — in the form of new blooms — will win, as warm air returns to my area today. 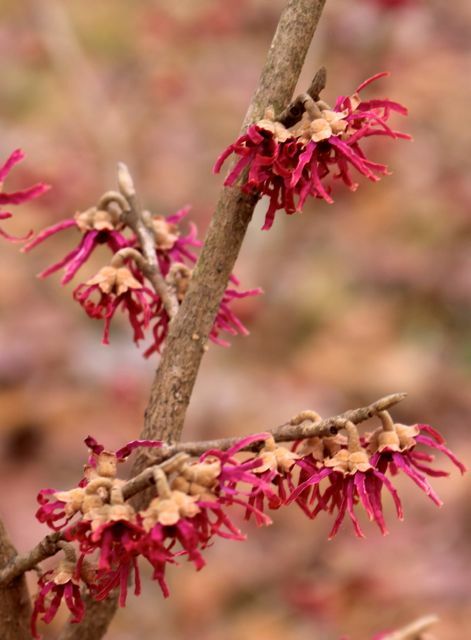 The Hamamelis x intermedia ‘Aurora’ that I planted last November is showing off just a few lovely orange-and-yellow strappy petals. I can testify that they are as deliciously fragrant as advertised, and quite impervious to cold snaps. Many of the birds that live in and around my yard are talking about love these days. The Barred Owls proclaimed their territory and ardor a month ago. I suspect they are nesting now, because I don’t hear them much these days; birds tend to be much quieter when they are nesting. Likewise, two weeks ago, a female Wood Duck paddling on the creek adjacent to my yard was shrieking in annoyance every time I accidentally got too close. Now she has gone silent. Did our absurd winter warmth coax her into early nesting? 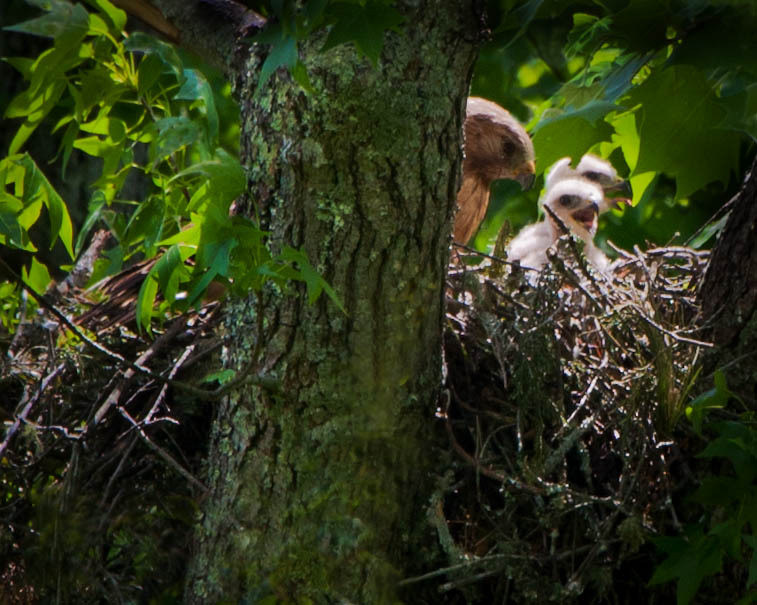 Last year, a pair of hawks refurbished the same nest, but we are fairly certain they did not succeed in bringing new life into adulthood. We watched the pair take turns sitting on eggs for about three weeks, then all activity stopped — love’s labors lost. 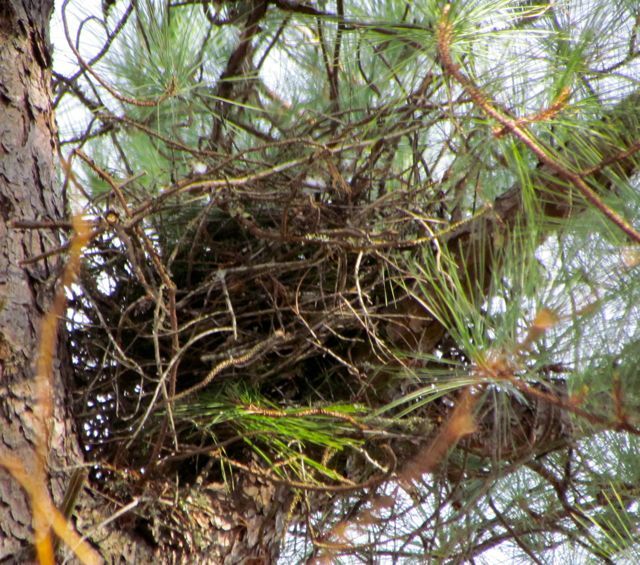 This year, we are hoping that the pair nesting in the pine will have better luck. I’ve read that Red-Shouldered Hawks mate for life, but they don’t live long, averaging only a little over two years most of the time. I don’t know if we’ve been watching the same hawks every year, or if perhaps the hawks on the pine nest are new to our yard. They may be offspring of the successful nest of 2010, because I watched the female borrow sticks from the old Sweet Gum nest, relocating them to the Loblolly Pine nest. 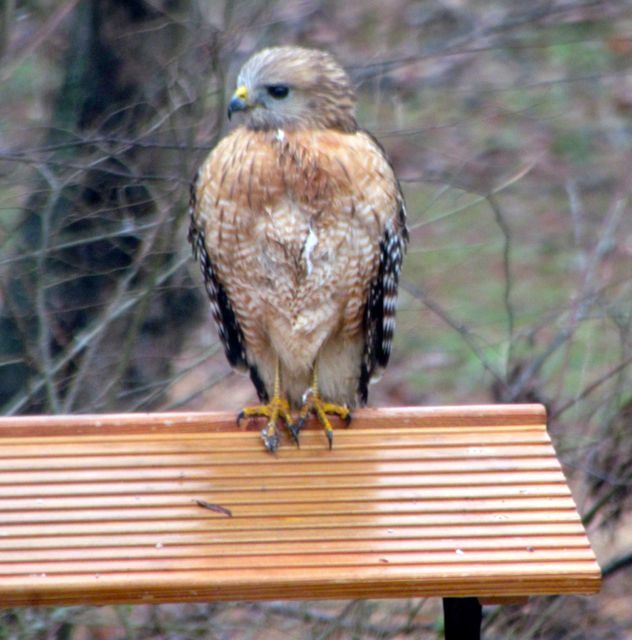 Would offspring be more likely to notice and use their birth nest than an unrelated hawk? I don’t know. Woodpecker drumming started up a few weeks ago too, and I’ve spotted several newly excavated holes near the tops of dead trees on the other side of my creek. 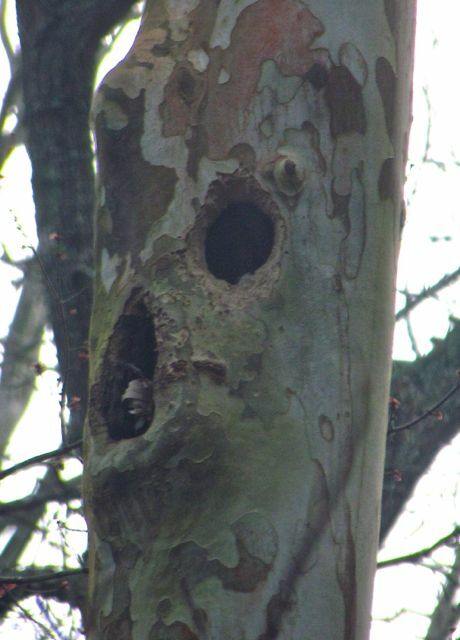 At least one hole is the rectangular shape characteristic of Pileated Woodpeckers, which we hear and see regularly. The woodpeckers and nuthatches have been devouring huge quantities of suet from our feeders lately. If they aren’t yet actively nesting, I’m thinking they are just about to. The male goldfinches have not yet started to brighten their plumage to summer sunshine standards, and mixed winter flocks of chickadees, titmice, and warblers still actively forage in our yard. 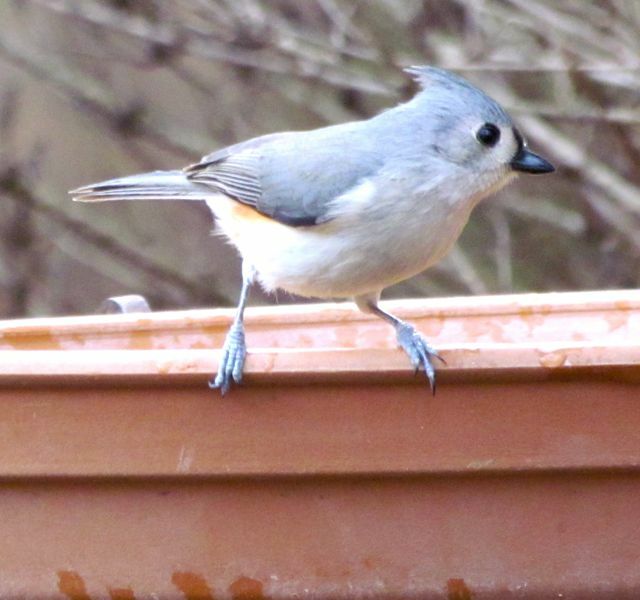 We’re in moderate drought here, so the bird baths that I keep stocked with clean, fresh water are very popular. At least once a day, a pair of Eastern Bluebirds that has been noisily inspecting nest box options for several weeks stop by to bathe, splashing out two-thirds of the water in the process. The pair that nests in the Purple Martin house every year always raises two broods — love’s labors won twiceover! If a love lesson can be drawn from observing the plants and animals in my Piedmont yard, I’d say it is that persistence pays. Love is hard work, but successful labors of love yield lasting beauty in the comfort of family. That’s a Valentine’s Day sentiment I think we can all endorse. Happy Valentine’s Day, Wonder Spouse — and to everyone else out there laboring for love. Yup, that’s a frog leg dangling out of the left side of its beak. From the size of the leg, I’m guessing dinner was a Southern Leopard Frog. Many dwell along the creek and in the adjacent wetlands, and their voices joined the Spring Peeper chorus more than a week ago. A few moments after I took the second shot, the hawk flew up to the nest and shared the rest of the frog with its mate. I believe humans consider the back frog legs to be the tasty part of the amphibian. 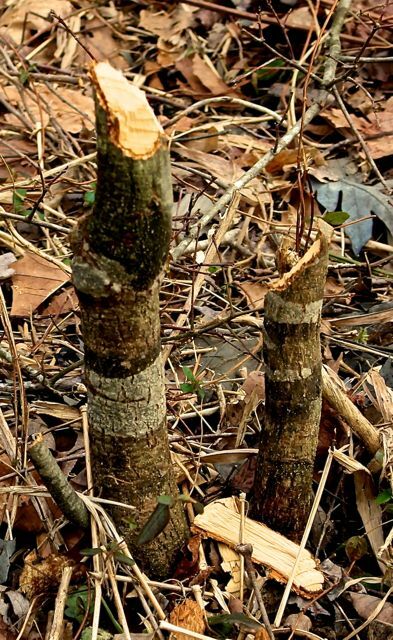 Perhaps the frog hunter saved the best bits for its mate confined to the nest. Such dances between Life and Death are common on my five-acre patch of piedmont. In this case, I figure tadpoles will always outnumber hawk nestlings, and so I am content. Can I believe it? 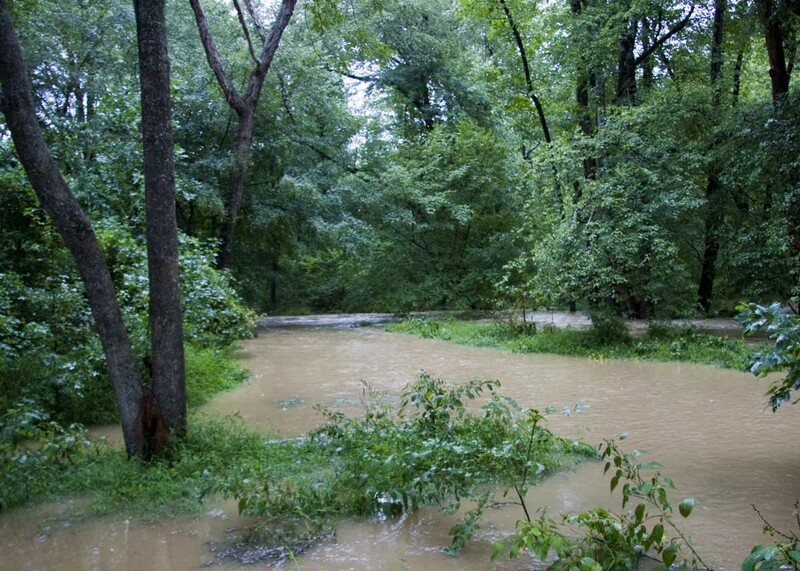 Is it really possible that my floodplain might look more like this 36 hours from now — minus all the summer vegetation, of course? I’m afraid to even write it, much less say it out loud. Last weekend’s promised inch-plus of precipitation never manifested at my house. The total in our gauge? A pitiful 0.39 of an inch. Enough to dampen the ground and make the birds chirpy. Not enough for mud puddles, creek-fortifying, or vegetable watering. Today those untrustworthy meteorologists are chattering excitedly about an impending significant precipitation event. Some counties near me have even been placed under precautionary flood watches (so they’re the ones who’ve been hogging all the water!). The radar is full of massive green blobs that are purportedly heading my way. I am struggling to believe they will reach my thirsty yard. Of course, if my creek overflows, that will present its own set of challenges. I worry about the Wood Duck couple that I saw quietly paddling up and down the creek this morning. Have they built their nest high enough off the ground to protect eggs/nestlings from disaster? It’s probably better that I don’t know the location of their nest. 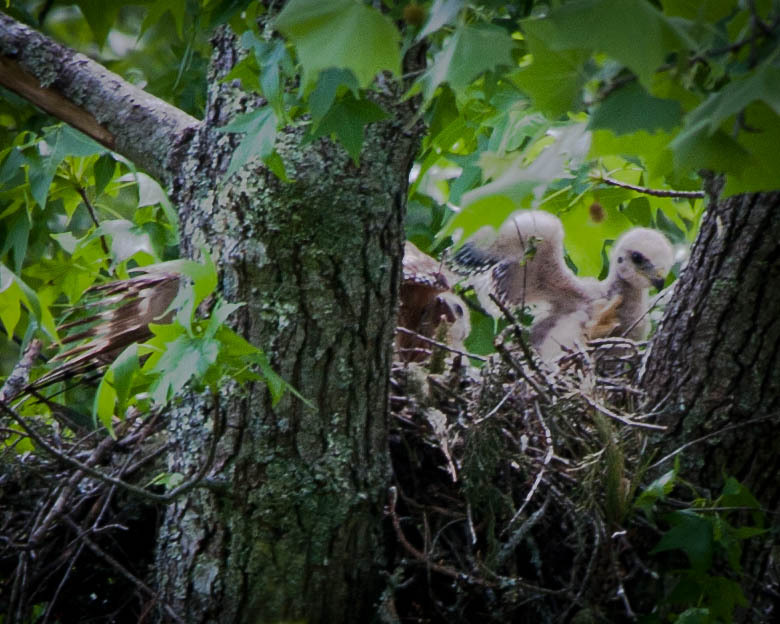 And a prolonged driving hard r— (no, I’m not going to type the word — don’t want to scare it away) will be hard on Mrs. Red-Shouldered Hawk and her young brood. I’m fairly certain that, two days ago, the eggs began to hatch. Suddenly both parents were flying back and forth to the nest excitedly. I can’t even step out onto my back deck now — much less walk on the floodplain — without both parents complaining loudly and constantly about my unwelcome proximity to their nest. 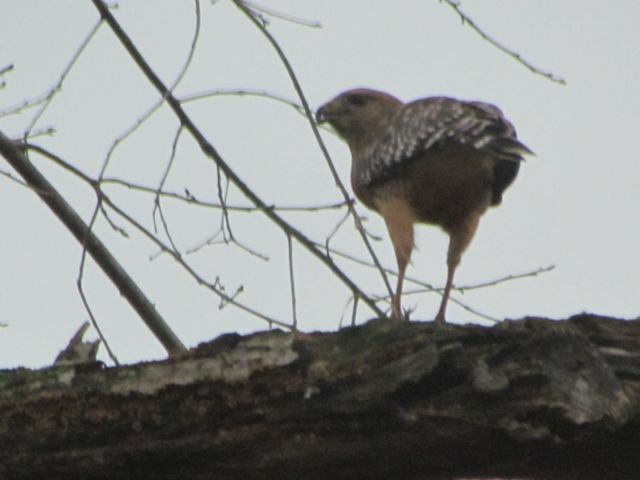 I watched Mr. Hawk acting more like a chicken than a hawk yesterday afternoon. I’ve observed Red-Shouldered Hawks hunting for earthworms many times on my floodplain. 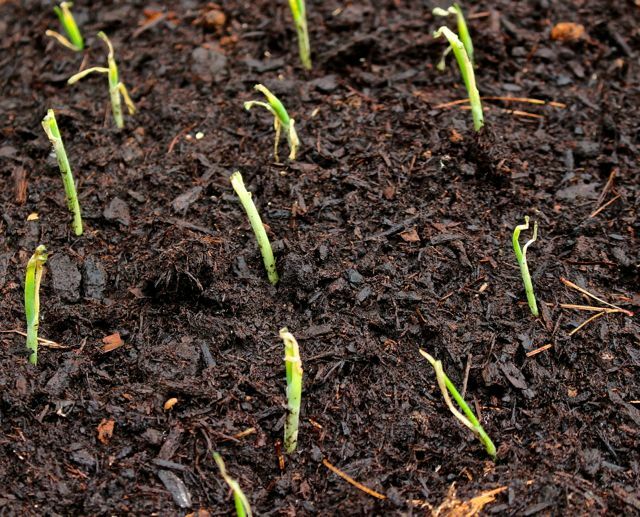 The moist soil keeps the worms close to the surface, and they are abundant in the loose sand-silt enriched by debris from occasional floods. Usually, the worm hunters are recently fledged birds. But yesterday, it was the parent bird. He settled near Brush Pile Mountain, where much organic debris provides excellent worm habitat. 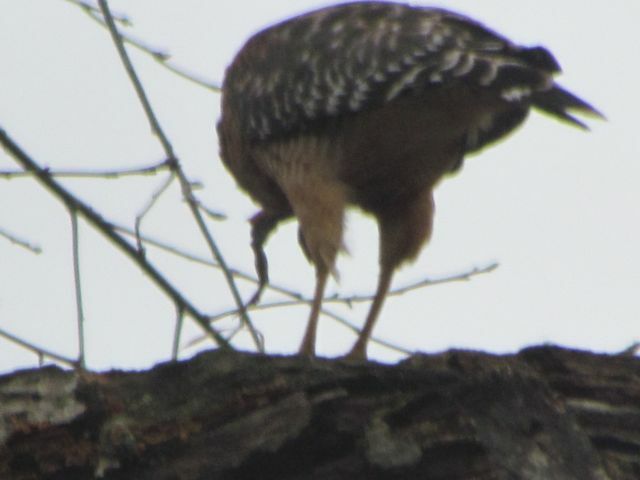 He made little jumps, talons extended, then pulled back his feet to scrape the soil. As fast as he scraped, he’d tilt his head to one side, looking for freshly exposed earthworms. When he found one, he immediately carried it to the nest. My theory — I’m not a bird expert, I’m just going by my observations — is that regurgitated earthworms make excellent first meals for freshly hatched hawklings. They’re high in protein, and lack bones, fur, or feathers, which are probably harder for parents to process into something good for their young ones. The parents gradually introduce larger prey to their brood as they mature. Maybe the reason I always see newly fledged hawks hunting worms on the floodplain (they always hang together at that stage) is because that’s the first food they remember. And, of course, a worm is much easier to catch than a field mouse or frog running for its life. For the hawk parents, the up side of a big precipitation event will be all the earthworms that flee to the surface to avoid drowning. All in all, a big precipitation event in my drought-stressed yard would definitely have more positive effects than negative ones. But I’m not counting my chickens — or earthworms — this time. I’ve been disappointed by fickle clouds too often of late.